We made it to the popular page! Remember, you do not have to donate, but if you want to and you're feeling generous, go ahead and press that button :) . 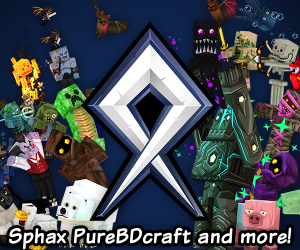 All donations will be going to a dedicated server fund. Can you re-upload your base mod for Minecraft 1.8.9 because of being no longer up? Help me bomb this place! Do you think you can thrown my Piece up there? a crash happened. how can i settle this? i did it all to use this mod but when the game is loading, it crashes itself. I don't know, I need the crash log to tell you what happened. gonna try it first if it crashes then if it is, i gotta give you the crash log. i cant find that anyways. also can you make it for 1.8 or 1.9? it would be great. we r awesome at doing things 3 is better then 2 right??? 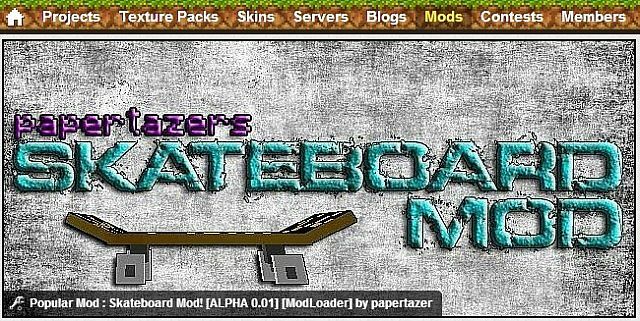 I have a friend that was looking for a skateboard mod, if this was updated to 1.7.10 I would add it to my modpack. I hope you find an artist soon. Hope you find one soon buddy! is this ever going to be 1.8? When Can we expect the 0.6 alpha to be released? You Know waht make this mod even better if you can add surfing and waves. (: I for one would get it and diamond it. 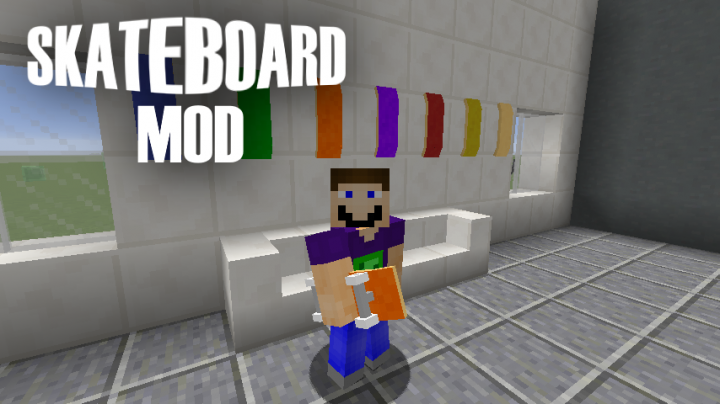 Are you still working on this mod? i'm still waiting for the 1.7.10 and its been about a year since the last update :/. 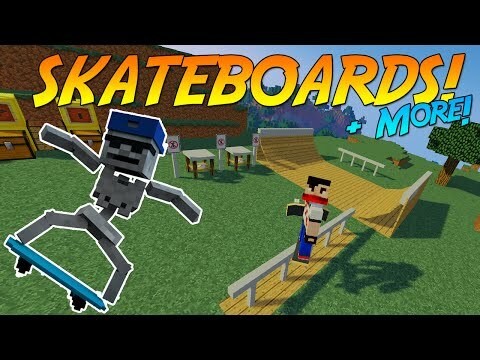 Can you also put in the config that you can remove the mobs in the mod because i only want skateboards and not the mobs. Thanks in advance, And btw, this mod is awesome! Ok now when i try and do 1.6.4 it does not load the game and only 1.7.10 works not 1.7 or 1.6.4. Yay another mod that doesnt work. Hello! I saw you were looking for a new artist? Well, I'm already 1.5 years learning to and making graphics for all sorts of things. Please react and I hope we can work together really well! PS: If you were wondering, I don't ask anything for my work, just a little patience (not that I'm slow). how the update coming along? Does it work for 1.7.2? This is only at ten percent? Dang. This looks great. Can't wait for 100%! Have a Diamond! my vision is to have skate spots, like the hollywood 16, and old ones like the carlsbad gap. But that will be in the future. As for your stance, maybe. It's Already An Awesome Mod! And It's Still In Alpha, Paper Goodluck!